Vomiting is one of the most common symptoms of disease seen in pets. It can be quite alarming to see your pet vomit up all his or her food or alternatively continuously wretch and only bring slime or bile. So should you rush your dog or cat to the vet immediately when you see them vomit, or is it safe to wait and see? Because there are so many causes of vomiting, we recommend that if you are ever in doubt, it is always better to visit the vet and have it seen to, even if it is just to put your mind at ease and prevent it from progressing to something more serious. It is important to realise that vomiting is not a disease or medical condition in and of itself, but rather a symptom of many different underlying causes. Healthy animals should not vomit, so there will usually be some underlying disease process which causes your animal to vomit. This could be as diverse as a brain condition, kidney disease, liver disease, gastrointestinal tract problems or endocrine conditions. It may have an infectious origin, but the cause may not be infectious at all and may vary from a physical obstruction such as a lodged bone to something as sinister as cancer. Distinguishing between vomiting and regurgitation is important. While vomiting is an active process which involves contraction of the abdominal muscles to expel the gastric content, regurgitation is a completely passive process where food is expelled from the stomach or from the oesophagus without any abdominal muscle contractions. Regurgitation usually points to a problem in the upper gastrointestinal tract, like the oesophagus. Nauseous dogs will often lick their lips and start salivating. This “overproduction” of saliva is there to protect the oesophagus against the acidic vomit moving up from the stomach by neutralising it. How many times has your dog or cat vomited? How long has the vomiting been going on for? What did your dog or cat vomit up? Has your dog or cat lost any weight? Is your dog or cat still eating? Has their diet changed in any way? What does the vomit look like? It is important to know if there is a runny tummy (diarrhoea) associated with the vomiting and if so, to establish your pet’s hydrations status. An animal that is not keeping any fluids down, and vomits throughout the day together with losing fluids through diarrhoea can dehydrate quickly. The vet will most likely feel (palpate) your animal’s abdomen to establish if there is any pain, or perhaps a foreign body stuck somewhere which may be palpable. Depending on the size or the location of a foreign body, it may not always be possible for the vet to feel it. Severe pain in the abdomen will alert the vet to a more serious problem like pancreatitis. Dogs and cats can swallow the strangest things which may cause a blockage in the narrower parts of the digestive tract. This can become a life-threatening condition depending on the type of blockage and the length of time the foreign body is entrapped. Some foreign bodies can perforate the gut which can cause the animal to go into septic shock. The majority of pets presenting with vomiting is due to dietary indiscretions and will recover within 24 – 48 hours. In these cases, the animal will show minimal abdominal pain, and hydration status will be normal, and temperature will be within normal limits. They are usually not severely depressed, but stay bright and alert. If the animal is bright and alert and healthy in all other respects, the vet may recommend skipping a meal or providing a liquid critical care diet together with access to fresh water. Food can then be introduced slowly over the next 12 hours. A bland diet of chicken and rice can be fed, or a veterinary therapeutic diet that is easily digestible and which has a low-fat content. 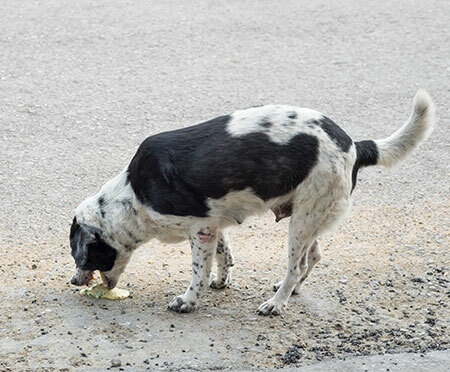 In some cases of animals vomiting, there will be certain things that indicate to the vet that there is a more severe problem than a simple dietary indiscretion. If the vomiting has been carrying on for more than a couple of days, continuous or intermittent, further investigation is always required. Severe weight loss, dry coat and general weakness are some of the danger signs. Raised or decreased body temperature, severe abdominal pain, and accompanying bloody diarrhoea should also raise concern. These animals should ideally be admitted at the veterinary practice and rehydrated with a drip. Animals that are losing fluids by vomiting and diarrhoea often also develop electrolyte imbalances. Glucose may be low due to anorexia lasting a couple of days, and the vet will need to assess what kind of electrolyte supplementation is required with the fluid therapy. While the animal is being treated symptomatically, the vet will start with further diagnostic tests. After a basic blood smear and microscopic examination, the vet may recommend a urinalysis and faecal analysis as part of a minimum database. If the diagnosis cannot be made with these basics diagnostic tests, more comprehensive blood tests may be required which will include a full blood count, biochemistry and electrolytes. If a definitive diagnosis cannot be made with these tests, further investigation with the help of diagnostic imaging which may include X-rays and or ultrasound may be recommended. Even with extensive testing and diagnostic aids, it may not be possible to make a definitive diagnosis immediately, and in these cases, the vet will discuss the merits of further diagnostic tests or procedures, or referral to a specialist vet, with you. Foreign bodies varying from stones to clothing garments, to anything other than pet food which the animal may have chewed and accidentally swallowed part or all of. Depending on the size and the type of foreign body it may either cause a partial obstruction or alternatively could cause a complete obstruction of the intestinal tract, which may only be rectified with surgery. The most important thing to remember is that vomiting is merely a symptom of an underlying problem which may or may not have anything to do with the intestinal tract. If your animal is vomiting and does not stop after a single episode, it is worth a visit to the vet to have it checked out.